Spectrum Elite is a unique and meticulously formulated new superfood exclusively for people with discerning tastes. 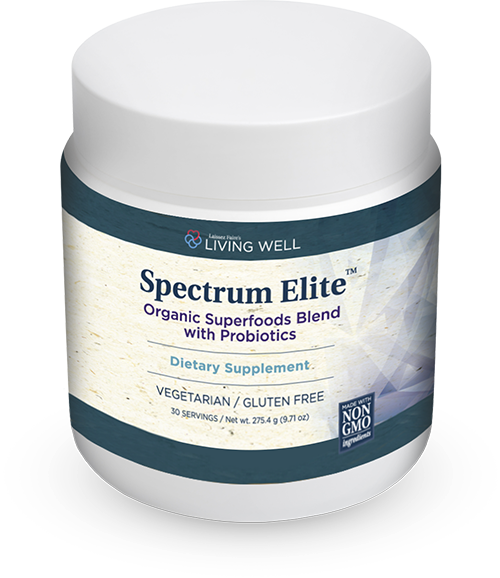 We call it “Spectrum Elite” because it contains wide mix, or “spectrum” of fruits, vegetables, natural fiber, probiotics and lots of other health-supporting nutrients. Spectrum Elite is super convenient, too. You just mix one scoop with water or juice and you’ll have a delicious drink made from whole 100% certified organically grown foods. It’s like getting a super concentrated serving of fruits and veggies – along with other vital nutrition – in one delicious drink. With Spectrum Elite, you can help make sure you’re getting enough fruits and vegetables everyday to optimize your health. Spectrum Elite isn’t loaded full of sugar and caffeine... but it supercharges your energy with natural ingredients. Spectrum Elite is 100% non-GMO. And every batch is tested to ensure it meets FDA gluten-free requirements. And you’re going to LOVE how it tastes. In fact, we GUARANTEE it. Take this opportunity NOW to discover just how great this new superfood formula tastes... and how great you feel drinking it every day. What are the quality standards Gold Leaf Nutritionals uses for their formulas, including Spectrum Elite? Is Spectrum Elite certified organic and non-GMO? Yes, Spectrum Elite is certified organic by Quality Assurance International. That means it is also non-GMO. Is there any soy or gluten in Spectrum Elite? Each batch of Spectrum Elite is tested to make sure it gluten-free according to FDA regulations. Spectrum Elite does not contain any soy ingredients, though it is processed in a facility that may process soy. Is Spectrum Elite made in the USA? Simply mix one scoop per day with water, juice, iced tea or your favorite beverage. It has a delicious berry flavor that is great on its own or blended with your favorite juice. It also works well in smoothies. We recommend you drink Spectrum Elite in the morning, or whenever you need an energy boost. Do I need a blender to make it? Is it gritty? No, you don’t need a blender! Spectrum Elite mixes easily with most liquids and won’t leave a gritty taste in your mouth. If you don’t have a blender, the next best way to prepare Spectrum Elite is to put it into a contain with a lid or shaker bottle and shake vigorously. If I have questions or am unsure about anything about Spectrum Elite, can I speak to someone on the phone? Yes, your supply of Spectrum Elite is 100% protected by our no questions asked anytime guarantee. You have an unlimited amount of time to try it out. If at any time you’re not thrilled with your results, we’ll refund you every penny of the product price. This could be your secret key to greater health, energy, and mental clarity. Spectrum Elite is made only with certifed organic non-GMO ingredients and every batch is tested to ensure it meets FDA gluten-free requirements. Take this opportunity NOW to discover just how fast this essential superfoods blend can help optimize your health and help you feel more energized and alert.